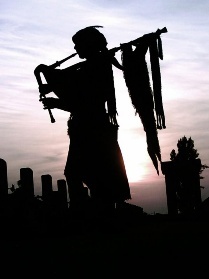 Clan Wallace are a tribal pipe and drum band encompassing all types of traditional Scottish music. They have toured the world playing at international festivals and promoting everything that is proudly and uniquely Scottish. The band was formed during the filming of Braveheart were they played between takes to entertain the film crews. They have been busy since touring and retouring the world playing music and appearing in Hollywood blockbusters like Gladiator, King Arthur or on TV in the home grown drama of Hamish Macbeth.